Trainer James Cummings believes that the 1400m of the Group 1 $500,000 Ladbrokes C.F. Orr Stakes at Caulfield on Saturday will suit Kementari first up. Kementari went through the 2018 Spring Carnival winless but has been installed as the $3.40 at Ladbrokes.com.au for the first Group 1 race of the Calendar year. “There’s no doubt he’ll be better suited over further, but he was luckless fresh up last campaign and he has good enough 1,400m form to think he won’t be too far away,” Cummings said. Kementari carried the Godolphin royal blue colours to victory in the Group 1 $1m Mostyn Copper Group Randwick Guineas (1600m) at Randwick during the 2018 Sydney Autumn Carnival but could only manage two Group 1 placings during the Spring. 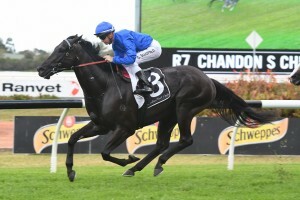 The Lonhro stallion was beaten a lip by Humidor in the Group 1 $1m New Zealand Bloodstock Memsie Stakes (1400m) at Caulfield on September 1 and two starts later was third to Brave Smash in the Group 1 $1m Ladbrokes Manikato Stakes (1200m) at The Valley. Kementari has drawn nicely at barrier two in the fifteen horse C.F. Orr Stakes field with James McDonald in the saddle. Cummings will also saddle up English import Best Of Days and is giving him plenty of hope even though he is marked as a $19 chance. Cummings was able to get the best out of Best Of Days during the 2018 Spring Carnival when the five year old stormed home to win the Group 1 $1m Kennedy Mile (1600m) at Flemington. Best Of Days has also drawn in close at barrier four and will be ridden again by Kennedy Mile winning jockey Craig Williams. The next three in the C.F. Orr Stakes betting behind Kementari are the Darren Weir castoffs Land Of Plenty at $5.50, Whispering Brook at $6.50 and Brave Smash at $9.50. The post 1400m to suit Kementari first up in 2019 C.F. Orr Stakes appeared first on HorseRacing.com.au.